Though it really has nothing to do with The Hunger Games, you can just imagine the Suits in Hollywood thinking, “Post-apocalyptic love-struck teenage heroines are big money right now! Hot diggity, let’s buy up the rights for every book on that theme we can find!” Meg Rosoff’s debut novel, ‘How I Live Now,’ is a brilliant piece of writing in its own right. That’s not to say that the timing of its release is a coincidence, however. 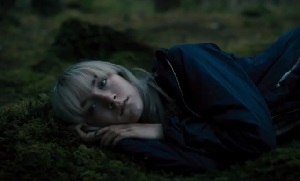 Saoirse Ronan plays Daisy, a teenage girl sent to live with her cousins in the English countryside. Though the film never explicitly explains the situation, it’s clear that war is brewing around them, and on a mammoth scale. When separated from her new family, Daisy must find the strength to carry on in a war-torn world. The book, which I just happened to read on impulse back in 2006, isn’t big on set pieces or large-scale storytelling. This is an intimate tale that uses war as the backdrop for the story being told. Some may find this frustrating, especially those who sought this film out simply because it has been marketed as a kind of real-world Hunger Games. To be honest, it never occurred to me that the book would make perfect material for a movie, so I guess I shouldn’t be surprised when it doesn’t. Ronan, of course, is wonderful. However, it’s hard to like a character who is, by any normal definition, pretty unlikeable. More to the point, the film doesn’t give us a reason why we should feel for the burgeoning romance between Daisy and Edmond (George MacKay.) It’s the kind of romance that feels like it occurs simply because a) both characters are good-looking, and b) there’s no one else around for them to choose from. This meant that the love story wasn’t particularly effective for me. As a piece of filmmaking, How I Live Now is technically wonderful. It looks fantastic and is brilliantly edited, the music is fantastic yet eclectic, and the film knows just how much of the war to show and how much to keep hidden. Kevin Macdonald’s direction is good also, and the rest of the cast do a sterling job. The film definitely kept me entranced for the 101 minutes, yet somehow left me feeling cold. This entry was posted in Film Reviews and tagged Drama, War by Stuart Wilson. Bookmark the permalink.